Given the response I've received, I'd like to expand to using a large screen and digital projector and make the sky more accessible to more people. This will be a new kind of experiment for me. Getting a good polar alignment while talking to folks, then dialing in focus, then messing with gain settings proves to be a big time investment as it is. If anyone has tried using a projector for outreach, I'd really love to hear about your experiences, and any tips you would care to share about making setup as efficient as possible. I'm using an AVX mount for tracking, an ED80 ota, and an ASI071MC. For live-stacking I use Sharpcap. Everything is on battery power, which might make using a projector and a laptop and the mount and the camera at the same time a little difficult. I won't have anything to add from experience with a projector, it probably depends on the battery power. I know I thought I was going to be fancy when I first started with a 24" LCD screen...that was short lived. The juice for that killed my jump battery in about 30-45 mins flat. Only thing I had on the battery was that (120v) and the LX200 pulling 12v. I suppose the inverter on the battery pack converting to 120v is what killed it so quickly. Projectors, I think, typically pull pretty good power to run a bulb as bright as they have. You may need an alternate power source if going that route. If you can find a projector that has a battery pack built in or one that runs on 12v, you may do better, but I'm not sure either of those options exist, though I've not looked, either. It will be interesting to hear how your setup evolves. I also use EAA for outreach with a system built around a Revolution Imager 2 and a little LED monitor. 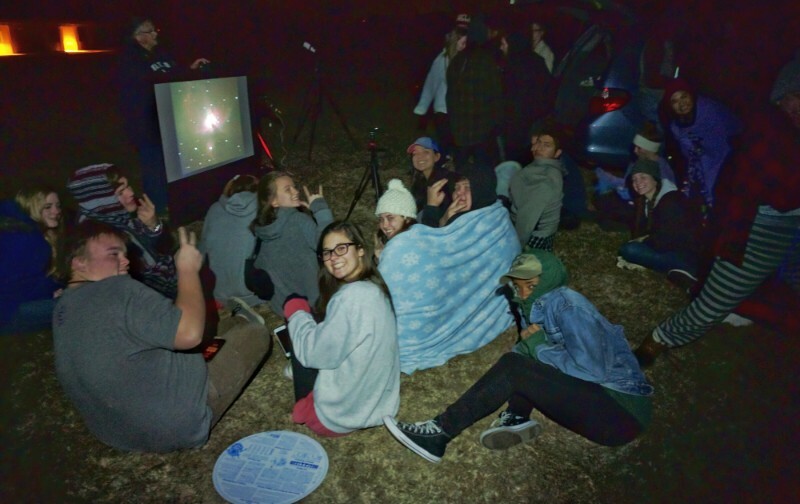 It a lot of fun sharing a evening of observing the deep sky under our Bortle 8 skies. The club in Cambridge here has used a similar set up for a number of years. 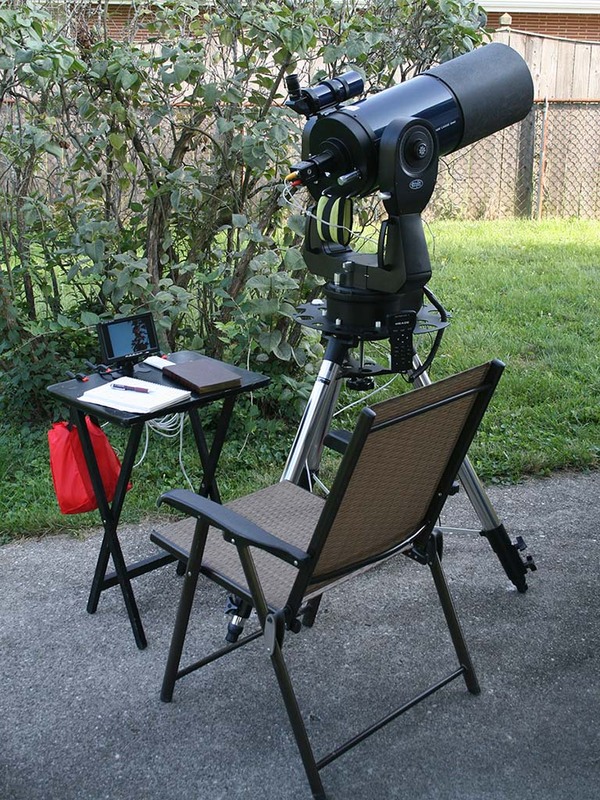 They use Meade SCTs and I believe now also a Celestron CPC. Arrangement is scope to camera (ZWO or QHY) then output to a laptop and the laptop display is output to a projector and the picture shown on a screen - hardboard painted matt white on a basic wooded frame. Think they have done that for a number of years as part of working with the university for public outreach. Seems to have been very successful, it is still going strong as I understand. The operation is a person getting a target, displayed laptrop then on the screen then a person with a PA system explains the target and gives information aout it, then on to the next. So needs a few to work well. 3 or 4 I would guess and that is 3 or 4 per scope. Also they used 2 or 3 scopes. one scope on a target while the other found the next target. Power is supplied by the observing area having dedicated pillars supplying 240v mains via outdoor standard 3 pin sockets and the pillar is further protected with a custom cover. Scopes I saw were on permanent piers. Makes alignment easy and accurate, you will have to get good goto alignment. Oddly you have to restrict the public, otherwise they are all over the scope, equipment, tables, cables and everything. Get a few tables. One for the laptop, another for bits. Can be done, not actually difficult, just a few bits to organise, power will I guess be the problem. Not sure how well an AVX mount for tracking, an ED80 ota, and an ASI071MC will work at the end. The equipment may not be up to it, or not up to a great deal. 80mm is not a lot. 1. projector/screen: I have myself done something a bit different, pointed a projected live FLIR thermal camera feed via projector onto the white siding of the house for Halloween (the little golbins can see themselves!). I imagine you've seen some outreach posts on CN while using the sidewalk or street as a screen. I wish I had a better mental concept of your normal context of operation. I appreciate the idea of a projector and screen offers a more durable concept of display. I am happy with using a 40" display I DIY'ed for harsh treatment survive-ability. 2. Power: having done imaging for a few years, I've benefited from veteran wisdom of the value of deep-cycle marine batteries and awareness of power draws of tech. I can testify that some of the most recent display tech offers surprisingly low power draws if done correctly. Anyways, I recommend utilizing a few types/sizes/of battery supplies based on the gear used. 3. laptop- older laptops are usually greatest offenders as far as power draws....also devices one uses to do everything with. I recommend purchasing a small, inexpensive, used laptop or tablet that runs only the pertinent software for EAA and does so in a low-power-draw footprint of a device. "Getting a good polar alignment while talking to folks, then dialing in focus, then messing with gain settings proves to be a big time investment as it is. " If you can, PA can be done by arriving early so you are not distracted by people? Also, with what degree of precision does your setup really require to produce a view-able stack? when so many just appreciate seeing the Moon (a little hyperbole). Edited by t_image, 11 October 2018 - 11:11 PM. Just had a thought - yes, occasionally the 2 brain cells accidently bump in to each other - for power could you use one of the small quiet petrol generators ? Think Honda make a good small quiet one. Likely a bit costly to buy one specifically maybe borrow from a frien that has one, is hire of one an option if easy and inexpensive. Would give an indication if the idea would work or not and the requirements. RT224 with a cheap 25mm F1.4 cctv on a stationary tripod. Cheap win 10 tablet running sharpcap, Live stacking the camera feed. "AAXA HD Pico Mini" LED Projector shooting onto a white wall, or a ream of news print. The news print is nice because it's cheap, and the younger kids can trace out the stars with crayons and take the sheet home as a souvenir. I also have a Bluetooth speaker connected to my phone so I can play Sky-safari's excellent (Celestron) audio descriptions. This has all been very interesting and helpful advice, and I appreciate it very much! Thank you! I will be happy to keep you posted as this project continues! For lunar/planetary, a regular CCTV/scope combo works well - I've settled with 6SE which is a good balance between portability/size/ease of setup, and enough aperture for planets (in conjunction with focal reducers and barlows). With DSO's during outreach, I stick with brighter objects - globulars do well in Bortle 6-8, and M57 and M42 are always a surprise that the colors show even in city conditions. For imaging I use a variety of CCTV types - Samsung, LN300, Malincam, etc. My *personal* preference is to forgo the use of any laptop and live stacking/processing software - for outreach purpose imo there's a more direct connection when explaining to visitors how the image is being capture by the video camera (granted the camera does some proc), and then sent directly to the projector - adding the laptop/processing component has that sense of 'oh, I have to process the images so that you can see it on the screen which updates only so often'. I have used DSLR for live stacking during outreach as well, but it's just different. The neat thing about EAA use in high light pollution situations is that you're limited to exposure length - this in turn (imo) makes polar alignment not as critical - many times I've setup and aligned a SE or EQ type mount with just plopping it down (roughly pointing it N for EQ's) and doing a 2-star or planet alignment, and tracking is more than sufficient for 8sec EAA. I have a flip mirror for centering any off-center goto's, and for DSO's bringing the f/ratio to 4 or below has been critical in my experience. Edited by core, 21 October 2018 - 02:09 AM. Setup here for HS Astronomy Class students - Samsung 435 CCTV, 6SE, 15 lumen (you read that right!) pocket projector, at Bortle 5 skies. 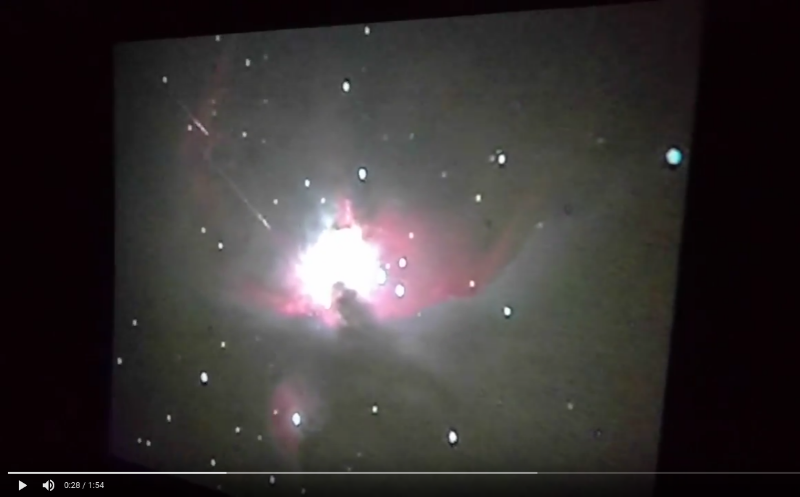 The neat thing about 'live' video is that you can see some real-time events happening, eg, such as geo-stationary sats crossing M42 - this is a frame grab of a video I took of the projection screen during the session above, when 2 satellites cross the FOV in real time. 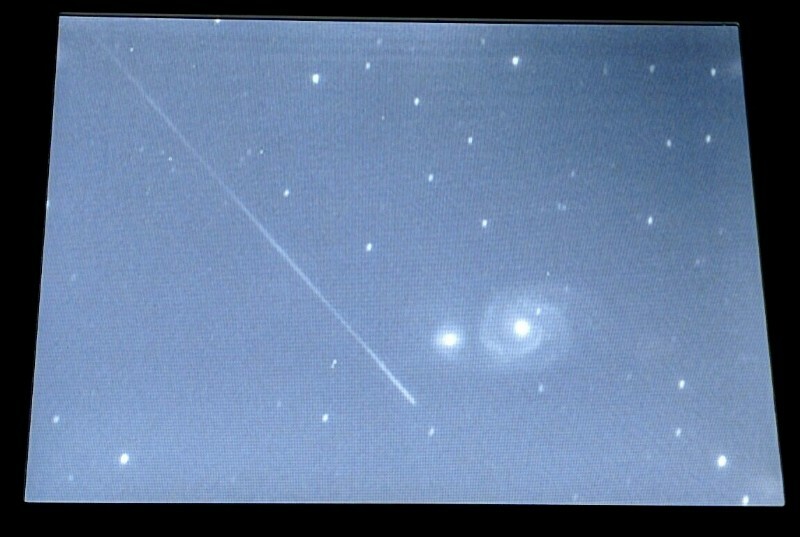 M51 with sat trail, pic off an LCD screen this time during another HS class session. Coolness! One thing that I enjoy about EAA for outreach is that observing becomes a shared experience. I can point to things, we talk about what we are seeing, and my favorite, I love asking "what do you want to see next?" What a fantastic setup! Thank you so much for sharing!!! Unfortunately, the equipment that has be alloted to me is the equipment that I have to use. That means that big beefy projector has to stay. The only real choice I have (and it's not much of a choice) is how to go about powering this setup. A pre-fab solution is necessary, I won't get approved for building anything. I'm writing a proposition to my boss for funding (up to around $600 budget) for a power source. Unfortunately the supplier must be on our approved vendor list, which limits my purchasing possibilities to using either B&H or Amazon. I'd very much appreciate any of your suggestions. Again, it must be a pre-fab solution. I'm beginning to think that the lead-acid power supply might be the best way to go despite the weight. I don't see myself getting more than a few hours with the lithium batteries. I just got back from an outreach event for grade school and middle school kids. I was set up with a system that is dedicated for outreach with young children; a Revolution Imager 2 on an 8" f/6.3 wide field LX200GPS operating at f/2.4. We spent the evening looking at a cross section of objects including open clusters, globulars, planetary nebula, emission nebula, and galaxies. The kids just loved it! With the younger ones we talk about families of stars and stars that blow bubbles, when the older kids we can talk about details at a higher level. The parents like it as well as there is nothing for the kids to hurt. In fact, I use a nice big magnifying glass to encourage the little ones to get close and mom and dad often get to help them with the lens. If your looking at a projector look at some of the pico projectors.